BOSTON (Reuters) – Billionaire environmental activist Tom Steyer, who has spent more than $140 million on fighting climate change, said on Tuesday he will spend whatever it takes to fight President-elect Donald Trump’s pro-drilling and anti-regulation agenda. The former hedge fund manager from California is putting together a strategy that will “engage voters and citizens to fight back” once Trump takes the White House in January, he told Reuters in an interview. However, he stressed he was not planning to fight Trump through the courts. 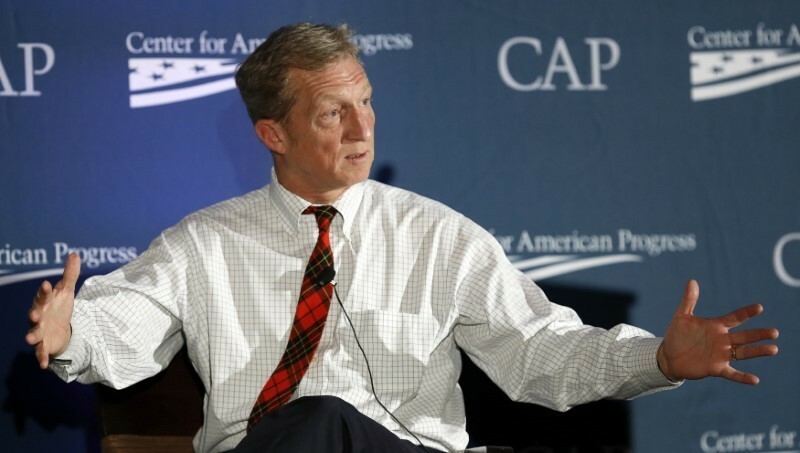 Steyer’s pledge to fight Trump suggests an intensifying battle for U.S. public opinion on global climate change, an issue that has already divided many Americans, lawmakers, and companies between those who consider it a major global threat and those who doubt its existence. Other U.S. environmental groups are also preparing to resist Trump’s agenda, with some vowing street protests and more established organizations that helped draft some of President Barack Obama’s environmental regulations preparing to defend them in court. “We have always been willing to do whatever is necessary,” Steyer said, when asked how much money he was willing to spend to oppose Trump’s agenda. Trump campaigned on a promise to drastically reduce environmental regulation and ease permitting for infrastructure, moves he said would breathe life into an oil and gas industry ailing from low prices, without harming U.S. air and water quality. He has also called climate change a hoax and has promised to “cancel” the Paris Climate Accord between nearly 200 nations to slow global warming, a deal he said would cost the U.S. economy trillions of dollars and put it at a disadvantage. While the approach has cheered the industry, it has sent shockwaves through the environmental movement, which is confronting the prospect of losing all progress it made during the Obama administration. Steyer, who had endorsed Democratic presidential candidate Hillary Clinton, called Trump’s policies dangerous. Steyer’s main political vehicle, NextGen Climate, on Tuesday called on the Obama administration to defy Trump’s pro-drilling agenda by issuing an order permanently blocking all new drilling in the Atlantic and Arctic Oceans. Trump has also promised to ask Canadian oil pipeline company, TransCanada Corp, to resubmit its application to build a pipeline into the United States that would link Alberta’s vast oil sands to American refineries and ports on the Gulf Coast. The project, Keystone XL, had been rejected by the Obama administration after years of mass protests and lobbying by environmental organizations. Steyer said the project may no longer make sense since a slump in oil prices has reduced the profitability of oil sands production. Steyer, who four years ago left the hedge fund firm he co-founded to devote himself full-time to environmental activism, said young voter turnout in areas where NextGen focused its mobilization efforts during the 2016 campaign was up more than 20 percent from the last presidential election in 2012. NextGen poured nearly $69 million into its elections related programs during the presidential campaign, according to federal records compiled by OpenSecrets.org, slightly lower than the $74 million it spent during the mid-term congressional elections in 2014, when only two of the six candidates it supported won.